The Anglian Coastal Monitoring (ACM), formerly known as the Anglian "Sea Defence Management Study", programme was initiated in 1987. It was the first coastal monitoring programme to be operated on a region-wide scale in the UK. Its intent has been to provide essential coastal data to inform tidal flood and coastal erosion risk management decisions between the Humber and Thames estuaries, which includes the low-lying and potentially vulnerable Anglian coastal frontage. Anglian is now part of a National Network of Regional Coastal Monitoring Programmes along with Southern, South West, North West and North East. The ACM Programme was always planned to be continuous and long-running. Indeed, its greatest value was anticipated after 20 years of continuous monitoring data had been collected, enabling longer term coastal changes to be identified over the whole Anglian Region. This will complement the understanding of short-term or seasonal variations identified during the initial years of the programme. To date the ACM programme has involved several phases of activity, yielding some 20 years worth of data. These data have already proved invaluable on numerous flood and erosion risk management activities over this period, from high-level and strategic planning, through coastal and estuarine process studies, to the design and post-project evaluation of schemes. In the early days topographic beach profiles were set out using reference objects (landmarks) and bearings from a permanent physical marker, using spirit levelling technology. Nowadays GPS/GNSS is used almost exclusively to survey the profile lines. This allows accurate positioning of the profile line ensuring repeatability and avoiding nearly all human error. Data collection is now much quicker and quality control much easier, as all data are recorded and traceable. Bi-annual (summer and winter) shore-normal beach profiles are surveyed at 1km centres and from 2011 this has been reduced to 500m. These are used for strategic analysis. In addition profiles are surveyed for selected scheme specific sites at closer spacing (down to 20m). 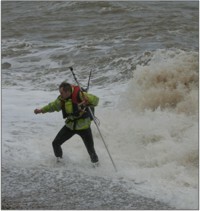 At beach renourishment sites ATV surveys are also carried out. Using ATVs captures more survey points in a much shorter space of time than the walked surveys, which enables the production of Digital Terrain Models and Difference Models to better target areas and to determine volumes for beach recharge. Originally, in East Anglia, we predominantly opted for single-beam bathymetric profiles, carried out on a rolling programme of open-coast and estuaries. Originally these were surveyed as extensions to the beach profiles and both sets of data "stitched" together. Nowadays due to advances in technology and significant cost reductions we undertake multi-beam bathymetric surveys to enable full mapping of the near shore seabed. This provides us with much more detail on how the seabed changes over a period of time. Where single beam surveys are still used the spatial resolution has been increased to 250m. Whereas in the past the bathymetric data had to be reconciled using tide gauges, today the vessel is positioned using RTK GPS/GNSS from shore-based control stations, which avoids the need to install the tide gauges. Aerial photography of the coastline, excluding The Wash, started in 1991 and remained vertical stereoscopic black and white until 2001. 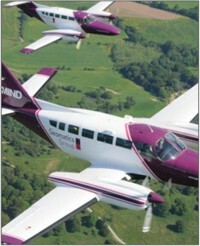 Open coast aerial photography is undertaken on an annual basis and selected estuaries on a 5-year rolling programme. From 2002 colour photography was captured and migrated from film to fully orthorectified digital images in 2005. Oblique photography is also collected to provide a different perspective for dynamic stretches of coast. Orthorectified aerial photography can be used to measure cliff erosion and beach erosion or accretion. As it is collected annually it can be used to identify changes in the coastline over a period of time. Anglian first deployed equipment for wave monitoring in The Wash 1999-2000 and subsequently embarked upon a 5-year rolling programme, deploying directional waverider buoys offshore and wave recorders near shore. In 2006 the programme went region-wide with offshore buoys and near shore recorders deployed for a continual 3-year period. The region-wide programme involved the deployment of 5 waverider buoys (at locations with water depths of approx. 20m below Chart Datum) and 20 recorders (at locations with water depths of 4m to 10m below CD). From September 2009 the recorders were removed but 4 of the 5 wave rider buoys will remain as part of WaveNet (data from these buoys are available from CEFAS). 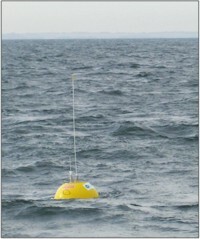 Data from the buoys and recorders were used to establish offshore to near shore wave transformations, from which "look-up" tables were produced to assist with flood forecasting. Data from the surveys is quality controlled using bespoke software, enabling the data from the beach profiles to be viewed. It can bring in maps, aerial and terrestrial photography and all can be viewed alongside various profile plots to assist with analysis work. The SMG produces reports, ranging from strategic trends reports to bespoke scheme specific reports. It also produces sea state reports on an annual basis and provides advice on coastal change processes. Developing technologies will determine the way we monitor the coastline in the years to come. Already, Radar and Video techniques have been used for continual monitoring on short sections of coastline where changes are occurring on a very short temporal scale. The use of Satellite Imagery is being utilised more as the resolution and availability improves. It is likely that sediment particle tracking will become a key part of monitoring coastal changes, as this will precisely determine sediment movement, vastly improving our understanding of coastal processes at vulnerable sections of the coast. The programme is overseen by the Anglian Coastal Monitoring Group, which reports to the EACG and comprises Representatives for each of the counties within the programme area, namely: Lincolnshire Norfolk, Suffolk and Essex. These Representatives are from Coastal Protection Operating Authorities within these county boundaries. Natural England and The Environment Agency are also represented.